It is the first encounter between East and West in 1974 and almost 3 quarters of the game have passed without any major incident. And yet, for many unnoticed, Georg Buschner, the East German coach has pulled his secret weapon from his sleeve: Erich Hamann. It was the game the East was eagerly awaiting ever since the draw for the groups were made in 1973. After a slight pause where every one stopped breathing, a huge round of applause followed. During the following 6 months however, the tournament was largely forgotten in the GDR as FC Magdeburg made headlines winning the Cup Winners’ Cup 1974 in Rotterdam against AC Milan. The all-German match was the last in the group stage with both teams already qualified for the second round of matches. The game was to decide who would finish first and second which determined the opposition in the second round. Obviously, the first placed team would get a stronger group. The closest West Germany came to scoring was after 39 minutes when Gerd Müller (who else?) hit the post. West Germany dominated the game but lacked the final initiative to win the game. East Germany on the other hand were quick on the counter attack. The game was set to finish 0-0, a draw that would have seen West Germany finish first. The momentum of the game however changed with the substitution of Erich Hamann for Harald Irmscher. 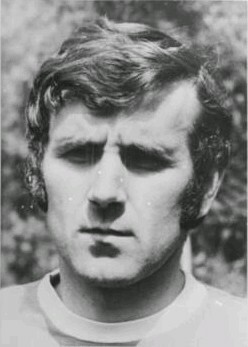 Hamann played for Vorwärts Frankfurt in midfield where he won the league in 1969 and the East German FA Cup 1970. Since 1968 he was an IM – Inoffizieller Mitarbeiter – of the Stasi, briefed to monitor the young players of his club. This may be due to his many injuries. A torn achilles tendon, ruptured cruciate ligament and continuous problems with this knees possibly ended his career prematurely. As a midfielder of the time he was trained in playing long passes to the forwards; a detail that has slipped Helmut Schön’s attention. Maybe, the West Germans were convinced they would not need any information about their Eastern opponents that no one took notice in the file about the GDR-team that Hamann was good at long balls. With a little more than 10 minutes on the pitch the substitution paid off. A West German attack was stopped, the East German keeper, Jürgen Croy launched a long throw to his right where Hamann picked it up 25m from his own goal. He had time and space to carry the ball forward and entered West German territory without facing any challenge. Only Beckenbauer tried to close him down. By then it was too late as Hamann has had a look up, saw Sparwasser running into space and let a long ball fly towards the West German penalty area. The ball bounced once before hitting the tip of Sparwasser’s nose, which deflected the ball decisively to get past Vogts and Höttges. Sepp Maier rushed off his line a moment too late and dived to prevent the unthinkable but ‘Spari’ lifted the ball into the roof of the net. With an attempted somersault, Sparwasser celebtrated. Given the result of the game and the final group table, it is therefore debatable if the team of Helmut Schön deliberately lost to avoid Brazil, Argentina and Holland. For the GDR, the victory had a sour aftertaste as winning the group meant facing three of the strongest teams. The result was a 3rd place behind Holland and Brazil but ahead of Argentina and the end of the only World Cup or European Championship the GDR ever managed to qualify for. The Federal Republic sailed through the 2nd stage without losing a game, scoring 6, conceding only 2. A fact that was often forgotten in later accounts of the match. Replaying the the scene over and over it is evident that Sparwasser is right. Without that exquisite pass from Hamann that looked not particularly dangerous once the ball set off from his right foot. The movement of the trio of Vogts, Cullmann and Sparwasser, the bounce of the ball and the latter’s tip of the nose turned the whole situation around and left the striker almost with no choice other than converting. Hamann and others of that team never had to endure so much attention as Sparwasser had to. No wonder, had he scored the most famous goal of East German football history. However, without the pass from Hamann, the goal would not have materialized. Sparwasser may be the best known from the match; yet football is a team sport and as such there were 11 men playing in blue shirts beating a team playing in white shirts.